Fighting is not about who’s better heading into the fight, or who’s better during that day. It’s about who’s better at every moment. Yup, fighting is about getting the upper hand during split seconds of battle. A few years back, I was watching this show on National Geographic called Fight Science. And by the end of the series, that was what one expert said regarding fighting. I couldn’t help but think back to that statement when I heard the news that Manny Pacquiao lost to longtime nemesis Juan Manuel Marquez. By knockout. No, that wouldn’t suffice. By KNOCKOUT. I always had this idea that Pacquiao, being the once-in-a-lifetime living legend that he is, will also lose once in a lifetime. And I never thought he would lose this way. That travesty of a loss to Timothy Bradley was not enough, perhaps. Because that wasn’t really a loss. But his fight before that, JMM-Pacquiao III, should have been a loss. As Rasheed Wallace says, ball don’t lie — or in this case, glove don’t lie. I didn’t get the chance to see the fight live. What I did get to see, though, were copious amounts of Twitter updates from regular viewers like my friends, to news agencies like ANC and Inquirer, to Yahoo! Sports’ Kevin Iole. I saw serious tweets, objective tweets, funny tweets, pro- and anti-Pacquiao tweets. I saw tweets from those who complained because they couldn’t watch, I saw tweets from indifferent people. My point is, I was very much updated with what was happening. Check this info out from Interaksyon, showing the punch stats of the fight. Manny connected on 94 punches compared to Marquez’s 52, 26 to 11 on jabs, and 68 to 41 on power punches. Pacquiao, based on punch stats, was clearly ahead. The difference was that JMM landed the more important power shots of the fight by knocking Pacquiao down in the 3rd round and finishing him off in the 6th. Remember how NatGeo said that fights depend on who’s better during the moment? Pacquiao was ahead and the judges saw it that way. Even my Twitter feed said so. I saw a lot of tweets saying Pacquiao was controlling the fight, that he was storming, that he was more aggressive. And that got him ahead in points. He even brought Marquez to the canvas in the fifth round. But come the sixth, both fighters traded blows. Being the counterpuncher that he is, Marquez ducked under to let Pacquiao’s right hook go astray. And he let a looping right hook go, all his weight behind it, leaned in to Pacquiao. A hard right counter haymaker lands flush in Pacquiao’s face, sending the eight-division world champion face-first into the mat, a knockdown eerily similar to the way he knocked Ricky Hatton out. During that brief moment, that split second of trading blows, Marquez was the better man. If there is any sport where single moments cause big changes, it is boxing. The knockout not only changed the fight (and a possible contender for KO of the year). It may have changed Manny Pacquiao’s stellar career as well. It is no secret that I hate the Los Angeles Lakers. I won’t even use the word “dislike.” I HATE them. When they beat the Portland Trail Blazers in Game 7 of the 2000 West Finals, when they “beat” the Kings in the 2002 West Finals, when they beat the Spurs in the 2004 West Semis, when they almost beat the Suns in the 2006 West 1st Round. I loathe the Lakers. I disdain them. The hatred that runs in my blood for the Lakers has become not just a temporary illness, but a permanent condition. While my peers were watching Goku, cheering him on in the hope that he would someday defeat Vegeta his nemesis; while my friends were watching Pikachu lose to all his bigger and more menacing opponents; while they were busy watching Kenshin, Sakuragi, those Gundams, Naruto; or while they were laughing as Jerry outwitted Tom, the Roadrunner tricked Wile E. Coyote, or Popeye beat up Bluto, I watched Shaq dunk the alley-oop pass from Kobe Bryant as the Staples Center erupted in cheers; my heart sank as Robert Horry shot the buzzer-beating three from the top of the key; Derek Fisher shocked me when he hit the game-winning three pointer with only 0.4 of a second to put up a shot. And at the same time as they were rooting for the protagonists to defeat their nemeses, I was cheering the opponent on, whether it was the Kings, the Trail Blazers, the Dallas Mavericks, the Spurs, the Bobcats, the Suns, the Knicks, whoever. Because when the Lakers play, to me the NBA is only made up of two teams: the Lakers and their opponent. This applied everywhere the NBA is. I’ve played at least one NBA video game since 1999. Never did I use the Lakers in any one of those games. I hated them in real life. I hated them on TV. I hated them in video games. Think of how Ateneo hates La Salle in the UAAP. One would hear a side heckle the other non-stop, from the start of the game up to the final buzzer. And maybe even after. That’s how I hated these Lakers. When Steve Nash signed with the Los Angeles Lakers months ago, I immediately thought it was a good move for his career. Finally, he would win a championship. Because he has had it all: All-Star appearances, two MVP trophies, deep playoff runs, Game 7s, blowout wins and losses, buzzer-beating wins and losses, triple-overtime games, a number of assist titles. But it was also bittersweet for me. Steve Nash has been my favorite player for the past eight years. He was the point guard of the team I rooted for since 2004, the Phoenix Suns. Being a huge Suns fan, I know and I’ve seen the struggles these two teams had in that time period. I saw in 2006 when the Lakers almost beat the Suns in the first round. I watched that fourth game that put the Lakers up 3-1, when Kobe hit the buzzer-beater in overtime. I vividly remember watching Game 7 of that series. My family and I were in Batangas and I saw the game on the now-defunct channel Sports Plus. I was screaming at the TV with every basket that put the nail on the coffin, as the Suns decimated the Lakers 121-90 (I remember that score by heart. I did not look it up.). And it was Eddie House who scored the Suns’ last three points. I can still recall the following year, 2007, the first round saw a rematch of the two teams. Amare Stoudemire said they won’t have the same drama that was present in their 2006 duel. He was right. They ended it in five games (Game 1 of that series was televised on a Monday, 3:30 am Manila time). Through all of those, Kobe said he hates the Suns the most because of all the difficulties they gave the Lakers. Likewise, Kobe, I hate your team too. And then Steve Nash joined them. Inasmuch as I would hate for Kobe to get ring number 6, for the Lakers to win banner number 17, for the Lakers to simply win, I would love just as much to see Nash head into the Finals, to finally get a chance to win at least one ring for himself, for him to remove the dubious distinction of being the player to play the most playoff games without a Finals appearance. Because, of all the great players to be ringless, Nash is the one I want the most to win one. When two extremes meet in the middle, or in my case, when two extreme emotions meet in the middle, an implosion might happen. Right now, these two sides are ramming head-on into each other. Root for the Lakers? Root for Nash? Nothing’s sure right now. But I still hate Kobe. It’s a bit too late to write about Manny Pacquiao’s fight. But I will, anyway. Look, I don’t mind Pacquiao losing. He lost his last fight versus Marquez. That was clear. But the judges gave him the victory, anyway. This despite being CLEARLY outworked by Marquez. That was a gift to Pacquiao. I watched both fights here in the basketball court near our house. Before the final bell rang, one gets to feel the expected outcome of the public. In the Marquez fight, the area gave off a “Talo si Pacquiao” vibe. In his latest fight, the opposite was felt. The pulse of the people said Pacquiao won. Based on what I saw, Pacquiao won, though not definitively (that’s another topic altogether). But the people don’t call the shots. If the results of boxing bouts were a government, it would be an oligarchy, with three judges controlling the results. No, it’s not a democracy. The watching masses have no say whatsoever on the result. They just have to accept it. And since they call the shots, they judge based on what they see, in the same way as the viewers judge based on what they see and what they feel. The problem is we don’t see the same thing. Judges sit in one place. They see the action from one angle and one angle alone for every second of the 36 minutes Pac and Bradley fought. Not so for us. We have the luxury of seeing the fight from multiple angles and variable camera heights. We have the benefit of instant replays, slow-mo footages, and highlights. We have the upper-hand in audio because, while they can hear the crowd clearer, they don’t have commentators who give their view on what is happening in the ring. I don’t exactly know what boxing’s standards are for a fighter to win a round, but in the UFC, the 10-point must scoring system is based on “effective striking, effective grappling, aggression, and octagon control”. When I watch a boxing match, I look mainly at effective striking and aggression. Pacquiao, I thought, wasn’t as aggressive as Bradley. The way I saw it, Bradley was starting most of the exchanges (take note on the emphasis at starting), but doesn’t follow through with it. In terms of aggression, I thought Bradley won the fight. While he was aggressive, he wasn’t very effective with striking. In the end, Pacquiao ended up the better boxer: rounds ended with him winning the exchanges. These melees happen because Bradley was attacking Manny, but Manny’s defensive prowess shined as the American’s offense connected less than the Filipino’s defense did. Based on these criteria, I gave to Bradley the rounds where Pacquiao did not land clean, crisp, head shots. I don’t think there were more than four or five of these rounds at the most. Pacquiao clearly won. It was a robbery. Then again, I had the help of instant replay at the end of rounds. Also the commentary from Mario Lopez and friend. In defense of the judges, maybe they saw something which we pay-per-viewers didn’t see. Maybe from down there, Bradley won. Maybe the judges were Americans and wouldn’t let an Asian beat them in boxing, the way they Asians are beating Americans in many areas. Maybe they were paid. Maybe the fight was fixed. Whatever they saw, hmm, I can’t find the right words. I can just shake my head in disappointment. Just like in a trial, where one is innocent until proven guilty, same goes in boxing. One must take, grab, seize the belt from the champion, not wait for the belt to be given to him. The challenger must be definitively, doubtlessly better than the champion. Today, Timothy Bradley fought better than most of Pacquiao’s previous opponents. But he did not do enough to win the belt. And that, for me, is what makes this split decision an absolutely horrendous decision. A boxing robbery at its highest form. There are two words used to describe the San Antonio Spurs the past few (or many?) years: old and boring. These two words are also the words experts and analysts say the Spurs are not. Old? Well, Duncan, Tony Parker, and Manu Ginobili are old, maybe even Stephen Jackson. But the rest are young guys. They say if you find the Spurs boring, you don’t appreciate the fundamentals of basketball, which is what the Spurs play with: fundamentals. That’s the reason one of Tim Duncan’s nicknames is The Big Fundamental. He uses basic low post moves. But he has become such a master at them that he is so hard to stop. I’ve been watching the Spurs almost every time they’re in the Playoffs, usually going up against the team I root for (most notably the Phoenix Suns in 2005, 2007, 2008, and 2010; and the Oklahoma City Thunder this year). I appreciate their craft, especially this year when they are one of the top scoring teams in the league while also playing quick. But still, when I watch their home games, I get bored. Why, you ask? The hint lies there in the last sentence I wrote. It’s their home court. The basketball court of AT&T Center in San Antonio is composed of two colors: black and wood brown. The Spurs logo, with only black, white, and silver, lies in center court. The paint area is black, as well as the sidelines. The lighting of the audience sections are not so bright. Combine a not-so-bright lighting with a bland, dark-themed court, plus a TV network to broadcast the game. Compare that with Oklahoma City’s skyblue court, or Miami’s fastfood-colored court, or Boston’s green, Chicago’s red, Philadelphia’s red, white, and blue. Almost all teams have courts which are pleasing to the eyes. Memphis’ homecourt also has a dark color to it (deep ocean blue? navy blue? I don’t know what to call it), but their brand of basketball is more casual-fan-friendly than the Spurs’. Also, the Grizzlies’ logo is more striking than the Spurs’. What does TV court appearance have to do with anything? How many people watch San Antonio live in a season? Maybe every team’s home crowd plus the San Antonio faithful. What if you’re a New Yorker and San Antonio is playing Phoenix? You turn to your TV and watch them there. And when you tune in, you see black, you see monotone, plus Tim Duncan posting up and the Spurs running a half court play set. No eye candy anywhere: court looks boring, play is slow. Sometimes, or maybe most of the time, the casual fan will watch San Antonio play not because of the Spurs, but because of who they’re playing (see: Playoffs 2012). No, I don’t find the Spurs boring. It’s their homecourt that LOOKS boring. Plus that nasty reputation they’ve built up over the years. Ten years. I am now a college student, my brother’s soon to take college entrance tests. I just left my teenage years behind. 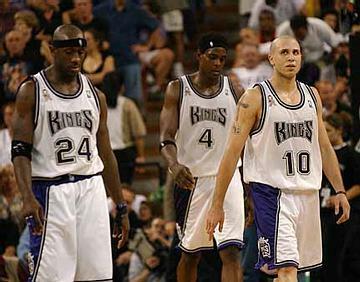 Yet images from the legendary seven-game Sacramento Kings-Los Angeles Lakers Western Conference Finals in 2002 still remain fresh in my mind, as fresh as the wounds which were reopened by watching part 6 of “The Greatest Tragedy In Sports” series on YouTube. The next week or so will mark the 10-year anniversary of perhaps the greatest playoff series of the new millennium. It was the series which I really tuned in to from wire to wire of every game, from the opening tip to the final buzzer; from the broadcasts opening billboard to the network’s “All rights reserved…” display on the TV. I fondly remember one game in the series which was scheduled to air on ESPN Asia at 8 am Manila time. I had a dream, and in that dream, the clock showed 8:00 am and I was still in bed. When it ticked one more minute, it was already 8:01 and I was still in bed. I panicked that I might miss the game. “Oh no!” I thought. I bolted up from my bed and checked the time. It was not even 7 am yet. I was that engrossed with that playoff series it permeated my dreams. So here’s a series of entries to commemorate each game from Game 4 to Game 7, the most dramatic games of the series. The entire time I was seeing free throw after free throw clang, go in and out, short, long, I attributed this to nerves. Maybe they were nervous, since they were facing the defending champions who are seeking a three-peat, yet here are the young Sacramento Kings, having their first taste of Conference Finals action with an entire city on their backs. Oh, get a win here and the confetti will start to fall, the crowd will be storming the court in joyful celebration. The Sacramento Kings will be on their way to the NBA Finals to face a much weaker New Jersey Nets team. The sold-out Arco Arena seemed like a pressure cooker. Besides Vlade Divac, no one has been in a game as important as this in their NBA careers. Not even Mike Bibby, their best player, who came from a mediocre Vancouver Grizzlies team in a trade for showman Jason Williams. It did. They only hit 16 out of 30 from the foul line. They lost the game by six. Thinking about it, the Kings might have won if they hit just half of what they missed. The Lakers won that game to become the first team in 20 years to win a conference final on the road. At that time, with the series over, I thought I just watched a regular playoff series; a series which would be forgotten and never considered a classic. Fast forward to today. I still remember images from the games. I still remember how I felt watching those games. I still remember the plays which made this matchup the series of that year and of the past decade. Scour the internet and search for a “best playoff series since 2000” list. Believe me, this series would always appear, along with Lakers-Blazers 2000, Suns-Lakers 2006, and Cavs-Pistons 2007 (the last two at least in my personal list). This series welcomed me officially to the NBA. For over half my life, I’ve been watching, celebrating, enjoying, getting pissed off, screaming at the (TV) referees, clapping, cheering, and analyzing. Life is good with it, and unimaginable without it. I’m looking forward to decades more, when I would have my own Larry Birds, Magic Johnsons, Michael Jordans, and Kareem Abdul-Jabbars, new playoff heroes for my generation. Game 6 is an infamous game marred by controversy. Many believe the game to be fixed in favor of the Lakers. And as I watched it again now that I’m more mature and knowledgeable, I agree. I am a Kings fan, sure, but the calls in this game, especially in the fourth quarter, were atrocious. Blatantly disrespectful. In one sequence, Vlade Divac came up with the loose ball, Shaq bumped him from behind, Divac fell and had to call timeout. No foul called, timeout wasted. In another, I’m not sure if it was Divac or Scot Pollard guarding Shaq, but the defender barely touched Shaq’s forearm with his thumb and got whistled for a foul. The Lakers attempted 27 free throws IN THE FOURTH QUARTER ALONE, compared to the Kings’ nine. Pollard and Divac fouled out. Star power forward Chris Webber almost fouled out. Heck, the Kings had to use Lawrence Funderburke to guard Shaq. For the Lakers? The only guy in foul trouble was Derek Fisher, who finished the game with five fouls. Even the commentators for that game were questioning the officials’ calls. Kings coach Rick Adelman always had that “Oh come on you’ve gotta be kidding me” look on his face. So was Vlade. The image below sums up the game. A ref has a clear view of the elbow thrown. The cameras showed him with his head turned towards Bibby and Bryant, yet he was indifferent to the blow delivered. He continued counting to five for the inbounder. 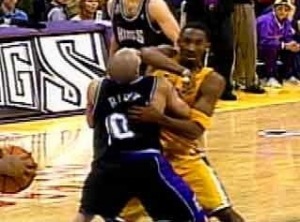 It resulted to a shaken up Mike Bibby with a bleeding nose, forcing the Kings to use their final timeout to have Bibby treated. An elbow to the nose doesn’t get called for a foul. A thumb to the forearm does. Not seen in this image is a referee (Bob Delaney, I think), which would’ve been in the lower right corner of the image, with a direct, clear view of this elbow from Kobe. The Lakers won the game 106-102. They only managed a four-point win even though they were playing 8-on-5 basketball (the Laker 5 plus the three referees). Who knows what Sacramento could have done had they had that final timeout? They could have set up a play and advanced the ball past halfcourt. Hmm. The Kings were up 3-2 heading into Game 6, and this game belonged to them. They should’ve won the series and the championship that year. It was only many years later when the Tim Donaghy scandal broke that this game became one of the focal points of the issue.